IFS HPC - The IFS HPC Standard is used to assess the safety and quality of the products / processes of suppliers and manufacturers of household and personal care products. ISO 9001 - EN ISO 9001 specifies the minimum requirements for a quality management system (QM system) that an organization has to meet in order to provide products and services that meet customer expectations as well as any regulatory requirements. At the same time, the management system is to be subject to a continuous improvement process. ISO 22716 - Is the preferred standard for the cosmetics industry within the EU and ensures compliance with the laws and regulations of the European Commission. ISO 14001 - ISO 14001 focuses on a continuous improvement process as a means of achieving the respective defined objectives in relation to the environmental performance of an organization. 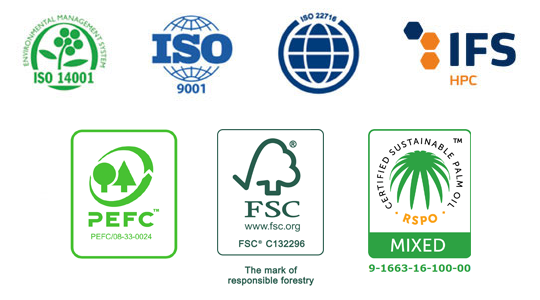 FSC® - Forest Stewardship Council. The FSC® system for certification of forestry was established to ensure sustainable forest use. PEFC - the Program for the Endorsement of Forest Certification Schemes (PEFC) is an international forest certification scheme to ensure and continuously improve sustainable forest management while ensuring environmental, social and economic standards.